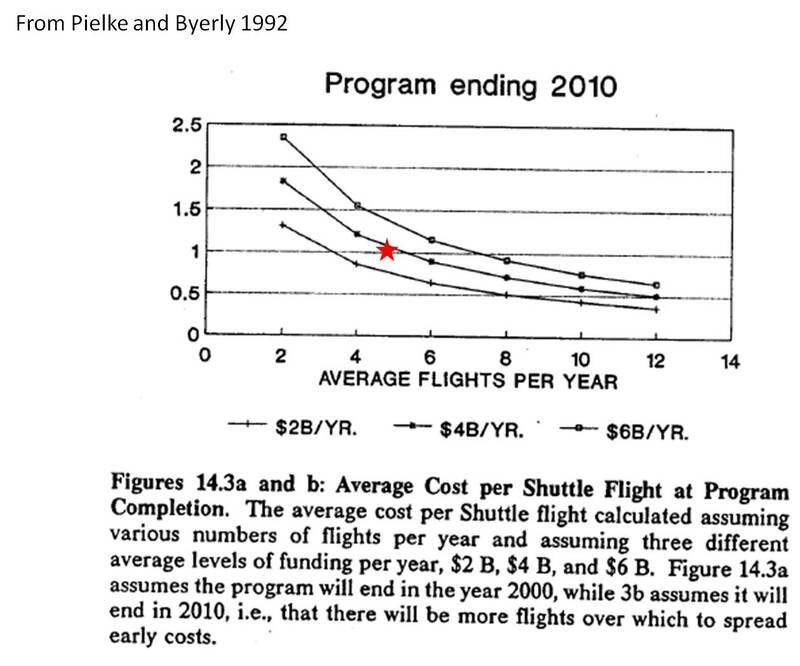 In this week's Nature, Rad Byerly and I have a short correspondence on the overall program costs for the Space Shuttle program (see figure above and data table below). The sources for the data are my 1994 paper on costs (PDF), the 2004 CAIB report and NASA annual budget submissions. The data are adjusted to 2010 values using OMB GDP price deflators (XLS). Obviously the information for 2011 is an estimate. The shuttle has been launched once this year's planned total of 3 missions. 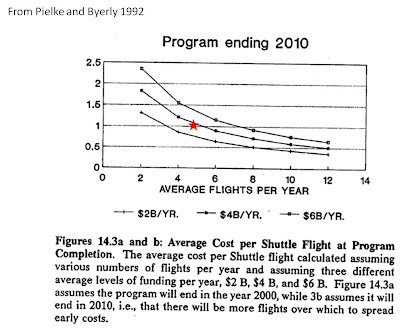 Some 20 years ago, we found the programme to be slightly over budget and severely short in capability (R. A. Pielke and R. Byerly in Space Policy Alternatives Ch. 14, 223–245; 1992). We used 8 years of cost and schedule experience to predict performance for the subsequent 20 years of the shuttle programme. 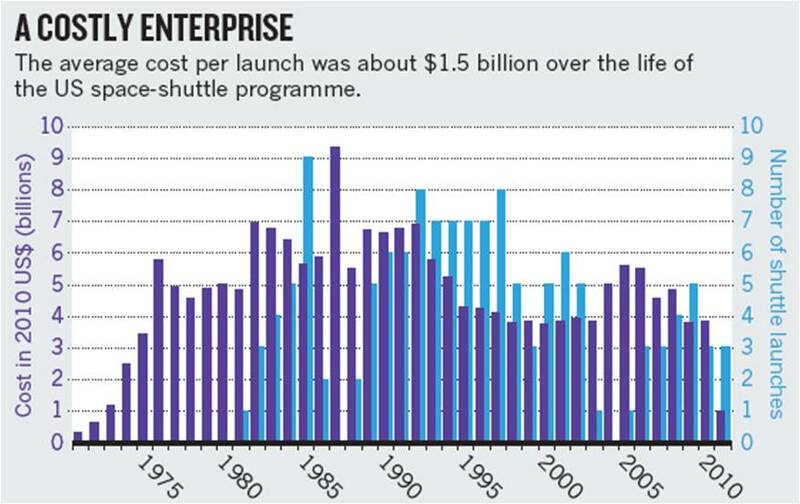 The US Congress and NASA spent more than US$192 billion (in 2010 dollars) on the shuttle from 1971 to 2010 (see ‘A costly enterprise’). The agency launched 131 flights; two ended in tragedy with the loss of Challenger in 1986 and Columbia in 2003. During the operational years from 1982 to 2010, the average cost per launch was about $1.2 billion. Over the life of the programme, this increases to about $1.5 billion per launch (R. A. Pielke Space Policy 10, 78–80; 1994). For the period 1991–2010, we originally projected an average cost per flight of about $800 million. The actual cost was about $1 billion. We overestimated both the flight rate during this time (8 predicted flights versus 4.7 actual) and the annual costs (about $6.2 billion predicted versus $4.7 billion actual). The actual cost for each flight of the programme falls squarely in the middle of the envelope we constructed, with projected uncertainties. Here is the figure that shows that envelope of uncertainties from our 1992 paper with the red star indicating how things actually turned out. 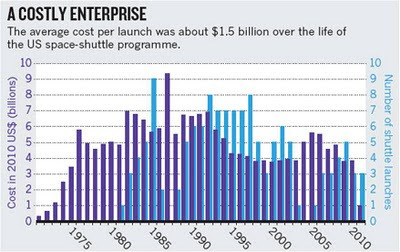 The shuttle is the costliest US spaceflight programme ever undertaken. As it comes to an end, we should celebrate its successes, and draw lessons to inform future human spaceflight ventures. 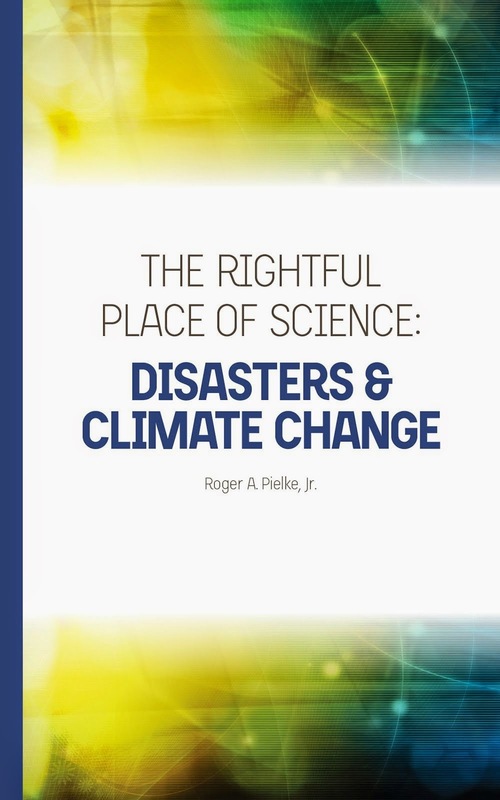 Pielke, Jr., R. A. (1993), A reappraisal of the space-shuttle program. Space Policy 9 (2) 133-157. Below is the data table that was used to generate the figure that appears in Nature and at the top of this post. Note that costs are for fiscal years and flights are for calendar years.